Sea Buckthorn Oil "Altayskoe Diveevo" buy for 6.9900 in store RussianTable with delivery. Is the richest source of natural vitamins, containing more vitamin E than all fruits and berries in Russia. Contains carotene (provitamin A) and carotenoids, vitamins (E, C, B1, B2, B6, F, P), folic acid, organic acids, flavonoids (rutin), tannins, macro-and microelements (magnesium, silicon, iron, calcium, nickel, molybdenum, manganese, strontium). Has a repair effect on damaged skin and mucous membranes, stimulates pancreas' external secretory activity, inhibits gastric juice secretion, protects cell membranes from damaging with chemical agents. 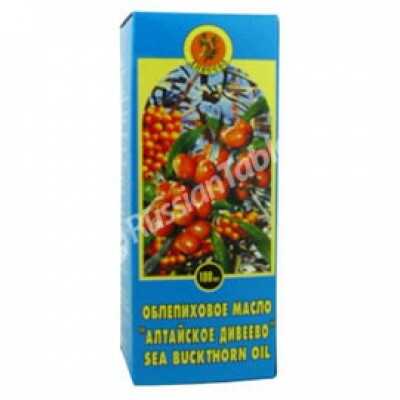 Do you have any questions about Sea Buckthorn Oil "Altayskoe Diveevo"?